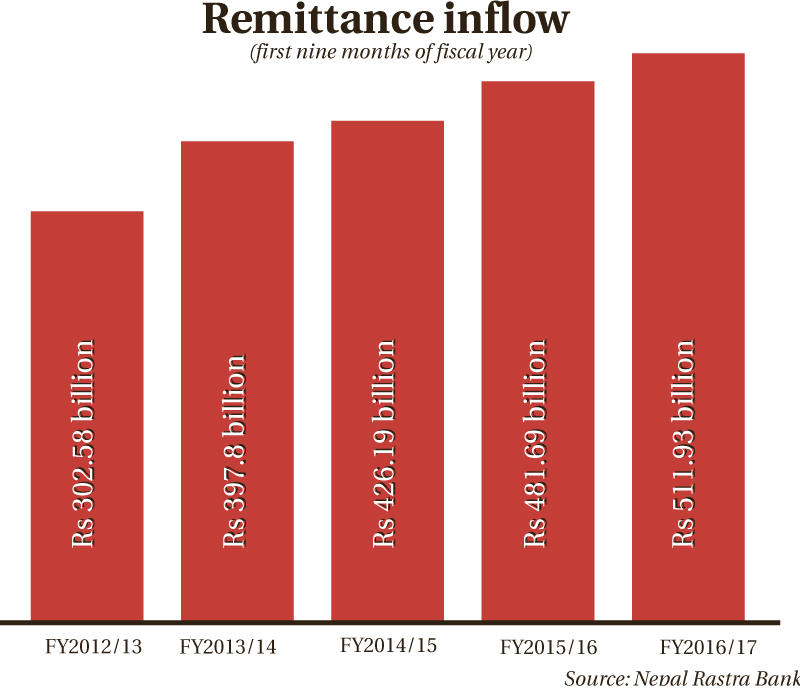 KATHMANDU, May 17: Remittances growth slowed to 6.3 percent in the third quarter of the current fiscal year 2016/17, down from 13 percent in the corresponding period of the last fiscal year. According to 'Current Macroeconomic and Financial Situation (Based on Nine Months' Data of 2016/17)' unveiled by the Nepal Rastra Bank (NRB) on Tuesday, the country received a total of Rs 511.93 billion in remittances in the review period compared to Rs 481.69 billion in the same period of the last fiscal year. Remittances growth has been falling in recent months as flow of workers to overseas job destinations is growing at a slower pace. The slowdown in remittances growth coupled with widening trade imbalance has also put the country's current account into deficit. According to the periodic report of the central bank, total trade deficit widened by 42.6 percent to Rs 671.20 billion in the review period. 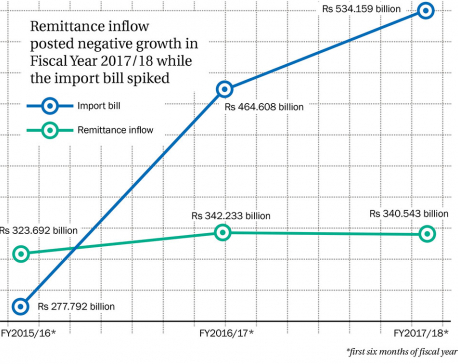 The cumulative effect of slowdown in remittances growth and sharp deterioration in trade imbalance resulted into the current account deficit of Rs 10.34 billion in the first three quarters of the current fiscal year. The balance of payment (BoP) remained at a surplus of Rs 50.64 billion and foreign exchange reserve increased by 1.7 percent to Rs 1,057 billion as of mid-April. Though broad macroeconomic indicators are heading toward positive direction, including low inflation rate, there are warnings that external sector pressure is building in the economy. In its Nepal Development Update last week, the World Bank has also pointed toward the external sector pressure to the country's economy. “Continued underperformance of exports, despite the end of disruptions, remains a persistent challenge. Remittances account for nearly one-third of GDP, with the majority of migrants going to oil-exporting Gulf Cooperation Council (GCC) countries,” read the World Bank report, adding that significant spending cuts, including on capital spending, announced in the GCC countries, and persistent contraction in departures of migrants, have contributed to lower growth of remittances and risk of a possible sharper slowdown in the forecast period (Fiscal Year 2016/17). Inflation increased to 3.8 percent in mid-April. While the inflation as measured in consumer price index (CPI) has slightly increased in the ninth month compared to 2.9 percent in the eighth month, people have got respite from the spiraling price rise like in the last fiscal year. Inflation was at 9.7 percent in mid-April in the last fiscal year. “The decline in year-on-year inflation is mainly on account of the previous year's base price effect and improved supply situation,” reads the central bank's report. Food inflation dropped to 0.7 percent from 9.3 percent last year, while non-food inflation moderated to 6.3 percent from 10 percent, according to the report. The hilly region witnessed a relatively higher inflation of 5.6 percent in the review period, followed by Tarai region (3.4 percent), mountain region (2.8 percent) and the Kathmandu Valley (2.7 percent).